Found 5 file extension associations related to Pages for iOS and 1 file format developed specifically for use with Pages for iOS. Pages is the most beautiful word processor ever designed for a mobile device. You can create great-looking letters, reports, flyers, invitations, and more on iPad, iPhone, and iPod touch — using just your fingers. Choose a great design. Write some brilliant words. Drop in a few images. That’s how you create everything in Pages. It all looks so impressive, it’s hard to believe it’s so simple. Everyone can read whatever you write — whether it’s on the web or via email, on a Mac or a PC. Pages keeps all your documents in one place, so they’re easy to find and to share. Now there are versions of Pages for Mac, iPad, iPhone, and iPod touch. And they all work together beautifully. So your documents go wherever you go — on every device you use. 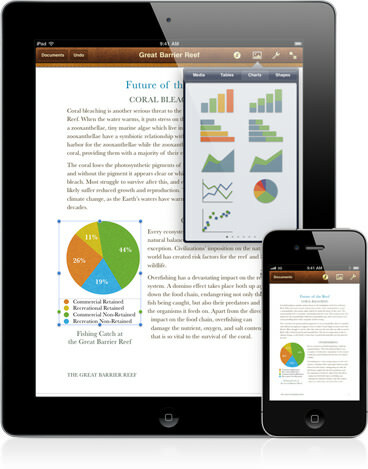 Open and convert Pages documents online - Using iWork for iCloud to make new or convert Pages documents. If you need more information please contact the developers of Pages for iOS (Apple, Inc.), or check out their product website.